Thanks to specially made valve systems, these aerosols spray in any position. And their non-oily formulas won’t stain clothes. Repels mosquitoes, biting flies, ticks, chiggers, fleas, and more. Bug Ban contains 14.25% DEET plus two other repellents to keep bugs at bay. Mild, light musk fragrance. 6oz. cans. EPA Registered. 12/Case. ​Providing a safe yet highly effective level of protection, these wipes offer a one-step controlled application, making them safer than aerosol and pump sprays around the face. Once applied, the formula is waterproof and greaseless, so it won’t interfere with activities or tasks. 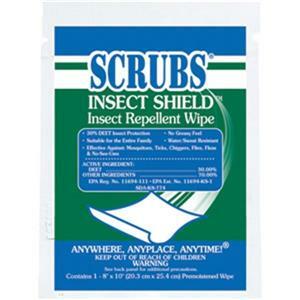 Each wipe contains 30% DEET and is individually packaged. 8" x 10".